When it comes down to innovations, no site excites me more than Zoopla. With its not always accurate Zed-index and its brilliant temp me, property price archive and some great iphone and Android apps, Zoopla now have created the Heat Map. Its awesome, it’s simple, its innovative. Simply search as normal but at the bottom of the area search, you can now view the prices as a heat map. High prices are red, medium prices orange – yellow – green and low price areas blue. It’s veyy simple but also a helpful way to identify the areas where location and budget meet. This will help to fuel Zoopla’s claims of growing faster than any other property portal in the UK. Zoopla says it’s seeing faster growth than competitors Findaproperty and Primelocation, with all three outsripping market leading Rightmove. 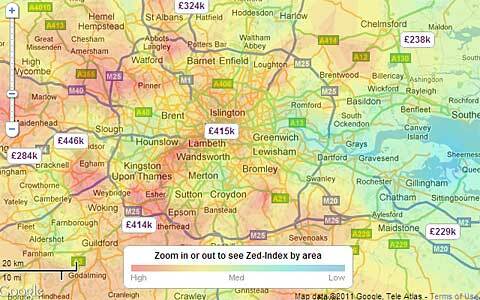 It would be nice for Zoopla to give a mathematical definition of how the ‘Zed-index’ value is computed. It must have a precise definition, or it would not be able to display it. Maybe most people are happy with the hand-waving ‘relative property value’ but it would be nice to understand it in more detail.